Place a large skillet over medium-high heat with 2 turns of the pan of olive oil, about 2 tablespoons. Add the onion, garlic and kale to the pan, and saute until tender, 5-6 minutes. Add in the tomatoes, basil, some salt and pepper. Using a wooden spoon or potato masher, crush the tomatoes up to make a chunky sauce. Bring up to a simmer and reserve the sauce warm. In a large mixing bowl, stir together the ricotta, parsley, egg yolk, Parmigiano Reggiano, some salt and pepper. Ladle about 1/4 of the sauce into the bottom of a large lasagna pan. Lay down enough eggplant slices to cover the bottom in a single layer. Top with about 1/4 of the ricotta mixture and repeat another layer of eggplant. Continue assembling the lasagna in that order until youve used up all the fillings, ending with red sauce. Sprinkle the shredded mozzarella cheese over the top of the dish and cover with foil. 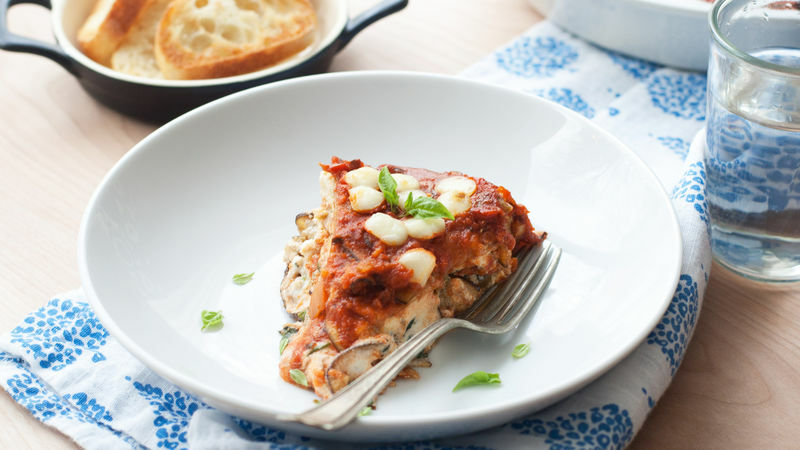 Bake the lasagna for 30 minutes with the foil on, then remove it and continue baking for another 15 minutes until the eggplant is tender and the cheese is browned.